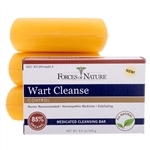 Wart Treatment Combo medicine pack of Wart Control Extra Strength 33ml and Wart Cleanse Medicated Soap 3-Pack. Strong, safe organic wart removal. Powerful treatment for the most stubborn warts. Rapidly eliminate resilient warts and heal damaged skin. Strong yet safe organic wart removal in our Value Size. 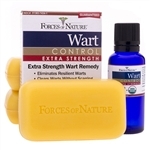 Powerful treatment for the most stubborn warts. Rapidly eliminate resilient warts Strong yet safe organic wart removal. Strong yet safe organic wart removal. Warts can be a common everyday problem for some. These resemble either a solid blister or a cauliflower and are caused by a viral infection. More specifically, the underlying cause of warts is the Human Papilloma Virus, or HPV. HPV can be broken down into 165 different strains that lead to a variety of warts; i.e., genital warts, common warts, and plantar warts which appear as a small rough growth that can show up anywhere on the human body, although they are more common on the hands and feet. • A common wart features a rough surface that is usually found on the hands, fingers, and on the feet; although they can grow anywhere. • Flat warts are small and smoother and generally fleshly colored warts that occur in large numbers commonly in the facial area, the neck, or the hands, wrists, fingers, and knees. • Filiform, or a digitate wart are thread or a finger-like wart that appear mostly on the face; more specifically near the lips or the eyelids. • Genital warts, otherwise known as venereal warts. • Mosaic warts are plantar warts that are arranged in a tight cluster and are found mostly on the soles of the feet. More information on plantar warts can be found under the category with that name. • Periungal warts are a cauliflower-like cluster of warts which occur around the fingernails and toenails. • Plantar warts are the most common of all these (which is why there is a separate category with more information). These are harder than the others and can occasionally be quite painful. • Cryotherapy is the most common way to remove a wart. It involves applying liquid nitrogen with the use of a spray canister or a cotton-tipped applicator. The chemical causes a blister to form around the wart and the dead blister freezes and falls off in about a week or more. • Salicylic acid is an over-the-counter drug that softens the skin layers so as to rub it off. This process could take weeks or even months and comes in various forms from paint, plaster, tape, a patch, or cream. • A more homeopathic remedy is tape occlusion (duct tape) which is placed over the wart for a certain period of time. Of course do you really want to put duct tape on your flesh and feel like a piece of malfunctioned equipment. 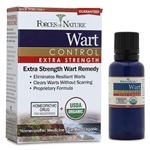 Now through Forces of Nature USA you can get natural wart treatment that is completely organic. This treatment is the best of the best in wart removal as it causes warts to dry up painlessly so as to flake away and is registered with the FDA and USDA certified organic. It contains no chemicals or any toxic acids and gets at those stubborn roots by penetrating deep into the skin tissue. This product can also be used to eliminate all of the different varieties of warts that are mentioned above. Since it is certifiably organic, it is a step up from the old-fashioned and out of date homeopathic remedies mentioned above. You really want to freeze your skin or use acid that could take months to rub off? Or worse, feeling like a piece of plywood with duct tape on you?